The Pakistani business class aspires for better integration and greater transparency but dreads the derailment of China-Pakistan Economic Corridor (CPEC), the multi-billion dollar investment initiative, which has infused new life in the country’s flagging industrial sector. The inclusion of both PPP and PML-N in the economic team, tycoons believe, can help the ruling PTl better manage the country`s relationship with China. They were keen to know the details of greater market access recently promised by the Asian giant. Since their return from China visit last week, the PTl hierarchy seems to be in a defensive mode, trying to counter the perception of a change in the attitude of the Chinese government that is read to be less warm than it was under previous governments. The finance minister reacted strongly and dismissed the impression of any kind of reluctance from the Chinese side to support Pakistan. He stressed that during Prime Minister Imran Khan’s maiden visit to China his team achieved its objectives. He graded the trip on a scale of A to C as ‘A+’. “The perception that is mentioned is absolutely without any foundation and can’t be further from the truth,” Finance Minister Asad Umar said when views expressed by senior Sindh government officials and leading businessmen were shared. Sidelining the suggestion of a more inclusive national agency for engaging the Asian giant, he said, “I strongly support the engagement of the private sector in the next phase of CPEC planning. In fact, in my opinion, it is vital for success.” Former prime minister Shahid Khaqan Abbasi thought the country’s relationship with China is too precious to be taken lightly. He mailed a measured reaction to the ongoing debate. “Every bilateral visit between China and Pakistan is important due to the depth and sensitivity of the relationship between the two. China has a long-term view of this relationship which is independent of the political dispensation in Pakistan. On the suggestion of a bipartisan body his position is: “There is a structural mechanism in place for CPEC which is functional and has produced results. Another senior PML-N member commented but did not agree to be quoted. He wrote, “Even if the China visit of the prime minister did not produce the desired results it can’t be termed a ‘failure’ owing to the sensitivity of the relationship between the two countries. “The Chinese will support Pakistan as a part of their long-term policy for the region. The level of support, however, depends on the confidence of the Chinese in the government here. A member of the Sindh government’s economic team said that no interaction with the PPP-led provincial set up took place prior to the China visit. His tone and position was not confrontational. Naheed Memon, who has closely dealt with the Chinese government and their private companies in her capacity as head of Sindh Board of Investment, was forthcoming. “Murkiness surrounding the basic understanding of CPEC and the Chinese game plan persists. “We can’t violate contracts awarded through international tenders, nor can we change their terms. If we do, we will lose credibility,” she said. The launch of CPEC in 2014 afforded massive investment at a time when other options either did not exist or were not viable. Pakistan`s infrastructure was in shambles and the industry was faced a massive energy deficit. The required scale of investment and associated risks kept the local private sector at bay and the government lacked the capacity and resources to respond to the need. Near perfect diplomatic isolation meant little scope of outside help. ‘It was a gift out of the blue,’ a retired trade diplomat said. 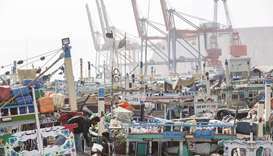 Disturbed by reports indicating suspension in release of funding since November 2017 and the Chinese reluctance to give a blank cheque to ensure exemplary success of its first landing station in the Belt and Road Initiative, the business community wished the government to rise above politics and seek the help of veteran parties, PPP and PML-N, who managed the relationship in the difficult initial CPEC phase. “Chinese inflows to certain projects under CPEC have dried up. Reportedly dismayed over the PTl hierarchy’s repeated statements to revisit the CPEC framework agreements and the hostility to the idea of third party inclusion in the bilateral scheme, the Chinese hierarchy conveyed its position during Khan’s China visit,” commented a leading businessman who is collaborating with China in an energy project and wishes to expand cooperation in other sectors. “The target should be to agree on a minimum economic agenda to insulate the country`s economy in the current critical phase from the volatility of politics. A logical first step in the direction could be to forge unity on the implementation of CPEC,” another businessman said. “Yes, initially we did express doubts but the fast progress on energy and logistic projects over the brief four-year period forced us to revisit our earlier position. “We think that greater transparency is desirable and equal treatment of local investors is important, but before anything else it is absolutely necessary to ensure smooth progress on all projects under the CPEC cover,” he said.